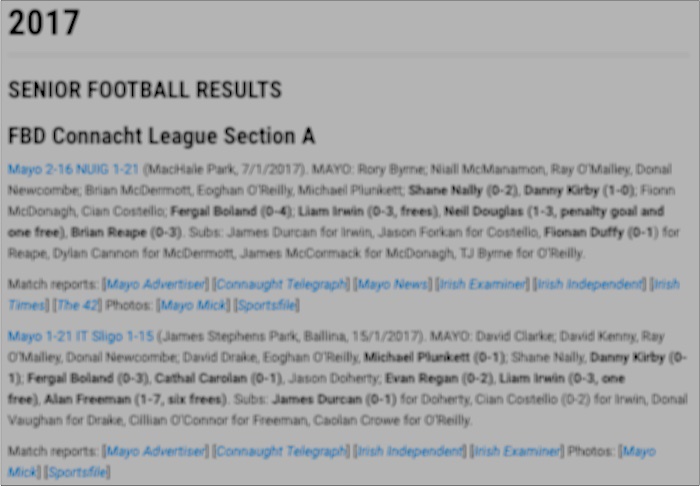 Every year once the action concludes another year of Mayo GAA results gets added to the archive here on the site. The results for 2017 have now been placed alongside the 115 years already there, the matches played this year now forming part of the rich tapestry that is the story of inter-county football in Mayo. 2017 saw twenty matches played at senior level (ten championship, seven League and three FBD), four at U21 level (North-West Cup and championship) and one championship match each at minor and U17 level. The U21 and minor results are of some small historical importance as they’re the last ones we played at these now defunct grades, the U17 one likewise as it was the first year this grade was contested. Inevitably, though, most attention will be drawn to what was, in every sense, a bumper season at senior level. 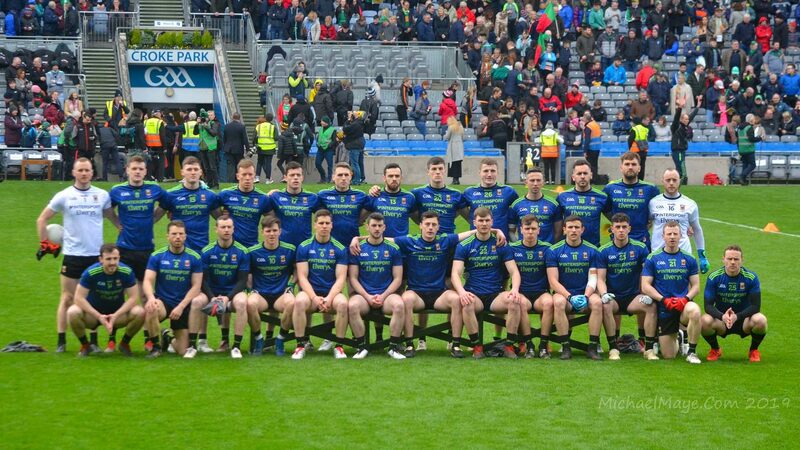 Twenty games, all manner of thrills and spills, on a journey that went all the way from the FBD in January to the All-Ireland final in September. Not only are all the match details listed in the archive but you’ll also find a treasure trove of links to match reports, photos, video, stats and analysis. This year I’ve also added links to the relevant episodes of the Mayo News football podcast. 2017 was, for sure, a year to remember for us. Much of what made it so memorable is now boxed away in the results archive waiting to be explored. It’s all here. This archive has become a priceless resource. Thanks for all your hard work in putting it together Willie Joe. I read this regularly and well done on this work. I do think we need to talk about underage football thoygh over the coming months. The senior team has been a great veneer to the county. But looking at underage results I feel we need to start thinking about the structures and how we can be consistently competitive. That’s the challenge and the worry now. Thanks for all your work over the summer and beyond. As they say it not work when it’s enjoyable and a passion. Now to settle in to the club action even if it means travelling from Athlone to watch the Mayo championship. There’s only so much roscommon u can watch?? Does anybody actually live in mayo? Every mayo person seems to be in some other part of the country! Willie Joe,.. Your doing incredible work on this blog.. I think people have won ‘Mayo Man of the Year’ for far less…. Andy for GPA.. Player of the year, and Willie Joe for Mayo Man of the Year… I know that a previous man called Wille Joe won it already… But I nominate Willie Joe from the Mayo Gaa Blog. Well said Leantimes I echo those sentiments. This blog is great it’s as much Mayo GAA now as wearing your colours to a Mayo match or roaring the lads on. Well done Willie Joe long may you have the health to continue this excellent blog. Thanks alot Willie Joe. This blog is amazing. I click into it every day.Keep up the good work. This is like a mobile library. Fair play to you WJ. It’s loverly to be able to pick out a year and and be able to to check on games played, players, subs and scorers. It really is a great interest and a lovely passtime going back through the years and what happened when the mind might be a little foggy. Echo all the comments above WJ and thanks for putting all this together. We go again! Maigh Eo Abu! As the grandfather used to say you’d be a horse of a man if you had a stump of a tail and you could shite walking. Thanks for .everything w.j. Savage work WJ, rivalled only by that quote from Richie Duck ? Thanks Willie Joe. If it was only the Indo, the Star and Telifis Eireann for the news and reviews we’d be in the ha’penny place. Great stuff and thanks again WJ. How you handle the moderation is incredible. Especially wh n see some sites. And the archive excellent resource. When compare to county board site which can’t seem to even update current results it’s remarkable what you do. This site is a fantastic resource for those of us based outside the country, well done to WJ.